Heat the Patties on [Medium High] on a Skillet for about 8-10 minutes. Turning them continuously. Awww...I am craving for a burger now ....!! !Thanx for sharing it ! Yummo. I could dig into that right now!! btw i tried out the healthy pasta recipe of urs, with my individual twist and got generous compliments from the husband, he even went to on to say that this is the best pasta ever and it was even better than the one we had at one of the high end restaurants that we had dined at some time back...i was glad to huge extent!!!! That really looks healthy! You actually made your ingredients also look yummy! Great job! It has the perfect nutry element! :) Tanvi, I love the sandwich thins that are out on the market today...only 100 calories and whole wheat to boot!!! 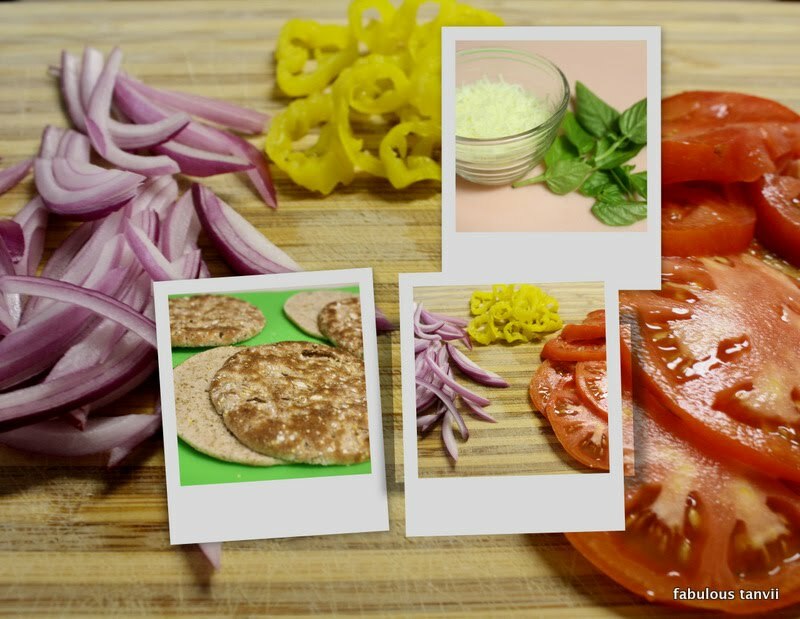 I like to layer them with a thin layer of pesto and some thin avocado and red onion slices (+ turkey bologna- I know you're vegetarian, but for us non-vegetarians there are a few more options out here)...makes for a nutritious and healthy meal!! This looks great and I love your experimentation with the collage! looks fabulous. I am printing this and adding to my "blogger recipe" files. It's almost tea-time here, i'm starving and the pictures are making me drool... Yummy!!!! 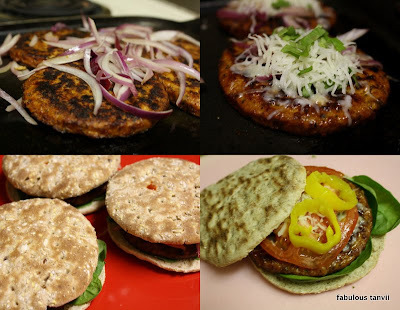 Healthier burgers - Love it! Thanks for posting this! I cooked (well, helped cook) for the first time today and I've officially caught the cooking bug. I'll be trying this recipe eventually! looks yum. Which brand of patties do you use? My fav is Morning Star. The Spicy Black Bean ones are to die for!! Sounds yummy. Speaking of burgers, have you ever tried Oprah's recipe for Turkey Burgers, it's all over the place online, and they are to die for. May not be as healthy as this version, but definitely delicious. Tanvii..I love your blog. I think you have some great information here. Some of your posts are immensely reflective and some real fun to read. Looking forward to more! seriously yummy! you're blog has expanded since I was last here! That looks really delicious! I am a pretty big fan of real burger and veggie burgers, and I think I could try this with either!